With the rapid video technology development, we hear 2K, 4K and 8K resolutions these years. Most people may familiar with 1080p high definition video quality. But how about 4K and 8K? Is 8K twice good as 4K? Can we watch 8K movies currently? When it comes to 1080p, 2K or 4K, many people are taking about their TV or computer's screen resolution. In this post, I restrict these resolutions in video fields. As we are confused about 8K, 4K, 1080P, 720P, etc., here's a look at what those all mean, as well as what the future might hold. 4K, otherwise known as Ultra HD, is basically a measurement of how many pixels are on the screen, and anything 4K has a resolution of at least 3,840 x 2,160 pixels. A 3,840 x 2,160 resolution means that you have the width consists of 3,840 pixels and the height consists of 2,160 pixels. 1080p means a resolution of 1920x1080. Higher resolution means more pixels to get you a clearer and better image. However, many people say that the video quality difference between 4K and 1080p to the naked eye is minimal. Actually, the visual differences become much more noticeable when the TV screen is larger (over 70 inches or larger) or when the watcher is further away from the television. Resolution: 8K has a resolution that is 4 times that of 4K at 7680 x 4320. Pixel: The 4K Ultra HD Pixel has a potential of 8 million pixels while 8K has a potential of 33 million pixels. Frame Rate: 4K has a frame rate of 60p and 8K is faster than 4K with frame rate at 120p. The visual difference between 720p and 1080p is obvious. The more pixels there are in an image, the clearer it will be. As such, a screen resolution of 1920x1080 (two million pixels when multiplied) should appear twice as sharp as a resolution of 1280x720 (fewer than one million pixels). The visual difference is striking at larger screen sizes. Spreading 1,280 x 720 pixels over a large area reduces the clarity of an image. Generally, whether it is 8K, 4K, 2K, 1080p or 720p, the higher resolution, the better image quality. However, you must note that the resolution is just 1 out of hundreds of factors that influence video quality. Currently, the videos with resolution of 720p or 1080p may be good enough to play on your computer or HDTV. Of course, there are some 4K TV in the market and you may see 8K TV in 2020. 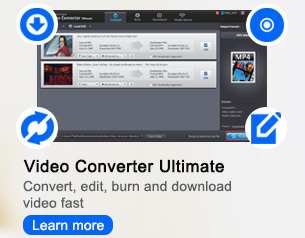 By the way, Video Converter Ultimate supports converting videos to 4K now. you can have a try.